Last time I departed St. Louis and resumed hopping from one medium sized town to another, dodging thunderheads and fleeing from tornadoes. I also received some gracious hospitality. Unfortunately, my good luck wasn’t meant to last. In the morning my host made flapjacks for breakfast. I really appreciated his hospitality, more than usual because he could so easily have turned me away. More than that he had opened up to me about the pain in his life. Sikeston has a bicycle shop, Semo Cycle, and I wanted to replace the tubes I’d used plus look into fresh tires. But they didn’t open till a bit later, and flapjacks aren’t super filling, so after checking out town I decided to have an early lunch at Lambert’s Cafe. I’d learned about Lambert’s a day or two before from locals. 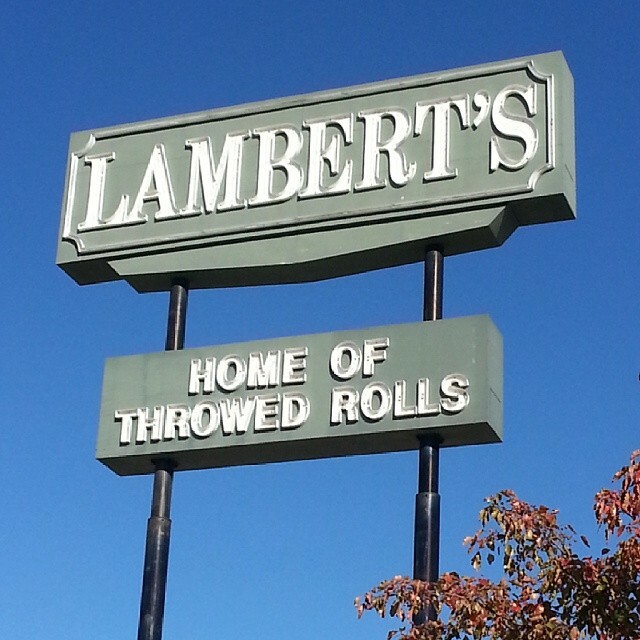 It’s famous because of its “throwed rolls” which means they literally throw their delicious, fresh-baked rolls at you from across the restaurant. They’re also known for gigantic portions. I sauntered in and grabbed a table. Aside from throwin’ rolls they come around with hot molasses and fresh apple butter (not throwed) to drizzle over the top. The roll sideshow is on the house, but the food is a bit pricey for a family restaurant. I was tempted to try some Missouri comfort food but it’d been a couple days with no salad and I find that greens are my best fuel on the road. Salad it was. It was disgustingly big. Which, at first, made me glow—the only problem with fueling on salads is that they’re usually tiny. This was served in a punch bowl. Layered with ham and croutons and tomatoes, there was no way I could finish this thing. I honestly considered asking for a box (there was that much left) but salad doesn’t keep on a cycle. Looking around, I started to feel bad. No one could finish their food. There were slabs of meat, sandwiches big enough to feed a family. Heaps of side dishes. Everyone ordered their own entree and half of every entree got left for garbage. I understand the allure of big portions, but it just felt wrong. I paid my bill and waddled out, energized by all the greens but nonetheless disheartened. At Semo Cycle I felt right at home. Tony, the owner, got me the new tubes I needed and answered questions about tires. Mine weren’t worn out completely but he agreed I’d need new ones soon. Unfortunately he was fresh out of the ones he’d recommend for me. He did a great job of giving me an honest breakdown and letting me make an informed choice. I decided to hold off, so we rotated my current tires and off I went. There was no way to go all the way to Memphis in one day—well over 100 miles—so my plan was to go at least as far as Hayti and maybe a bit further. I didn’t make it. Less than 25 miles down the road I blew another tube. I was truly fed up at this point, changed it and walked it to the next gas station to use real compressed air instead of killing myself with my cheap pump. Fortunately three gas stations were clustered together, because the first one had no air! …and made it maybe a quarter mile tops. Pop! At this point I knew something was wrong. I re-examined the tire but there was nothing stuck in it. It was worse: the rubber had worn away in one spot on the tire’s edge, exposing the metal mesh that gives a tire strength. That metal mesh ripped right through each new tube. Contrary to common wisdom, duct tape cannot fix everything. At this point I knew I was not going to space today. I had to hitchhike. Now, I couldn’t allow myself to hitch forward—that would be cheating—so I crossed to the northbound gas station. I needed a ride back to Sikeston. It was the first time in my Adventure that I was forced to turn back. Word spread quickly around the truck stop. I focused on pickup drivers, but the man who came up to me was a commercial driver for an energy drink company. He offered to put my bike in the back and take me to Sikeston as long as I promised not to say what company he was with, so he wouldn’t get in trouble. Promise kept. No one ever expects how heavy the Giant is loaded, and I was afraid we would pop energy cans laying him on top of them. But those things are like artillery shells and we had no problem. After I accompanied him on one of his stops, the familiar town of Sikeston loomed before us. I told my new friend to just drop me at any motel near the freeway, which he did. He was a friendly and good natured guy and I have to say he made a huge difference in my day. I thanked him and got a motel room. Apparently September 27 was a day of firsts, because I believe this was my first time getting a motel, too. The cost bothered me but there wasn’t much choice: I wasn’t going to crawl back to my host from last night with another sob story, and with no wheels I couldn’t scout for a camp spot. Besides, after hours of changing tires in the drilling sun I was ready for some AC. I called Semo Cycles. Tony was about to close for the day, but said to bring the bike over first thing in the morning. I wasn’t up for another feed trough meal at Lambert’s. Instead I walked to a supermarket and got a salad, some rotisserie chicken, and beer. It was definitely a beer night. The next day didn’t necessarily get better. I’ll post it soon, but until then you can check out all my road logs. Available in paperback and on Kindle. Get your copy here. ← What Makes SPU Students “Heroes”?